Here at Mercedes Chauffeur Hire we’ve been providing chauffeur driven wedding car hire for over 21 years and during this time we’ve been privileged to supply wedding cars for some truly majestic wedding ceremonies. One thing which never fails to amaze us is how some couples plan everything down to the last detail. Wedding venue, décor, cars, dress, hair and make-up, speeches…… but yet so little planning goes into finding someone who will immortalise those once in a life time memories – the Wedding Photographer! All too often we witness weddings where every detail has been planned to perfection, but when it comes to wedding photography, the bride and groom get “short changed”. This could be due to a misconception that all photographers are the same, or it could be that couples don’t know the secret of choosing the perfect wedding photographer. With this in mind, we thought it would be a good idea to create an article for all budding brides and grooms. 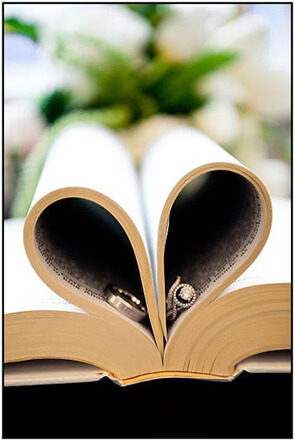 Hopefully you will find this information helpful in your search for a wedding photographer. A good wedding photographer will produce a stunning visual record to cherish and share with family and friends for ever. However, herein lies the problem. What’s the best way to go about choosing the right photographer? All too often this task is put off until the last minute as couples think that with hundreds of photographers to choose from, how difficult can it be? Surely they will easily find one at short notice. In fact, that couldn’t be further from the truth…… finding an experienced wedding photographer takes time and effort and requires a fair bit of thought too. (A point worth noting is that a good wedding photographer can be booked for up to two years in advance). It might be easy to find a photographer but finding a wedding photographer is more of a challenge. They may well be excellent portrait, studio, or holiday destination photographers, but that doesn’t guarantee that they will be good (or experienced) at wedding photography where they literally have just “one shot” at capturing the essence, mood and emotions of the wedding. It’s important for the couple to know in their own minds what they want when choosing a wedding photographer, as this will make the whole selection process that much easier. Before starting the search, take some time out together to assemble a collection of the type of wedding shots that really grab you, the sort of photos that make you smile, or the ones which tug at the emotions. Why not carry out an internet search, check out blogs, or look in wedding magazines? Once you’ve got an idea of what you like, then you’re up and running. Word of mouth is one of the best ways of sourcing a wedding photographer. Why not ask family and friends for personal recommendations, since most of us value and trust our friends’ opinions. It can also be a way of finding out those photographers to avoid! The internet is another good starting point, although at first glance the choice of photographers’ websites can seem rather daunting, and a little bewildering. Couples can make it easier on themselves by narrowing down their search. Traditional/Formal wedding photography – This is the sort of photography where everyone stands shoulder to shoulder and looks towards the camera. This dates back to an age when camera exposures were several minutes long and subjects were carefully positioned and had to remain still. It ensured that the happy couple were pictured with key groups such as family, bridesmaids, friends etc. You probably wouldn’t want your entire wedding day shot like this, but a few such poses would probably please the older generation. Contemporary photography – This style is more relaxed with the photographer acting spontaneously and capturing the fun of the occasion. In addition they will rely far less on poses. Rather than conventional photography, this contemporary style appears more like a director overseeing a movie of the bride and groom’s special day. 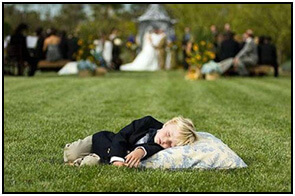 Consequently, no two weddings are ever alike which is why this sort of photography is so popular. The photographer can also seek out settings and backgrounds which will reward the couple with a stylised set of photos not dissimilar to the kind you may see in a fashion magazine. Reportage Photography – This is another term for what is essentially photo journalistic or documentary wedding photography. Basically, it sets out to show the day’s events as they unfurl, a bit like a fly on the wall documentary. Much of the time, the photographer will be in the background and there will be very little posing of groups or individuals. The wedding couple are likely to get many candid and unusual shots that they wouldn’t necessarily have with contemporary or traditional photography. However, the drawback can be that they won’t know entirely what to expect. Quite often this type of photography is shot in black and white. Artistic photography – As its name implies, this style of wedding photography is influenced by the creative juices of the photographer and his/her own sense of individuality. Depending on the photographer there could be a lot of intervention or practically none. He or she may make use of sepia colouration or darkened corners, which can result in stunning cutting edge photos, but for some couples it can seem a little too risky. You may even decide on a variety of styles that meet different criteria, such as the traditional posed shots to keep your granny happy; reportage, which creates a visual account of the hours leading up to the wedding and throughout the big day; and the contemporary style which provides amusement for friends and can be posted onto your Facebook page. Once you know the photography style you’re after, most research can then be done on-line by entering search specific keywords. Having searched, budgeted and planned, a short list of possible photographers should then be drawn up. The next step is to contact each one, ask if they are available on the wedding day, how much experience they have, and whether they specialise in weddings. Once you’ve spoken to everyone on your list and narrowed it down to who is available and who you feel could be well suited, then ring them back to arrange a meeting to discuss things in more detail. Chances are that during this meeting you’ll find out whether the vibes are right and whether you feel a connection. Since your chosen photographer is going to be following you around for a large part of the day, it’s vital that you ‘hit it off’ in order for him to get the best out of you. If you do gel, your photographer will stand a much better chance of producing those stunning photos which really bring out your personality. Remember, if you don’t feel at ease with the photographer BEFORE the stresses of your wedding kick in, you’ll definitely not feel comfortable with them ON the day of your wedding. Even the smallest of irritating mannerisms which bug you will only get even more irritating when it’s ‘show time’. The best way to build a rapport with your photographer is to ask if they offer an engagement photo shoot or a pre-wedding shoot. Many photographers offer an informal photo session so you can get in some photo practice beforehand. Come the big day, you’ll feel relaxed in their presence and it will undoubtedly shine through in the photos. It’s important to choose a photographer that you are confident you’ll get on with since you will be spending the best part of your day with them. Will they put you at your ease in front of the camera? There’s nothing worse than a stressful or pushy photographer! If there’s the slightest possibility that personalities may clash, avoid them. Is there a back-up plan should their equipment fail? What happens if they are injured on the day and can’t attend the wedding? What about a back up plan? 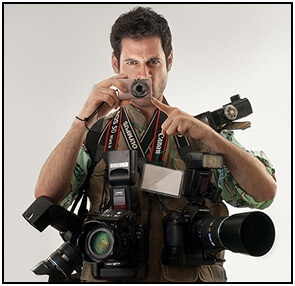 Be sure to ask the photographer whether or not they carry back up equipment. With today’s advanced technology, it also means that there is more to go wrong, and any such problems probably can’t be fixed right away. The last thing anyone wants is for the camera not to be working and for there not to be a back up plan to put into action. Ask whether they will be the actual photographer attending your wedding or will they be sending whoever is free on the day? Whilst this may sound shocking, it happens more often than you can imagine. Be clear as to who the photographer will be and ask to see his or her work and meet with them individually face to face. A portfolio is always a good gauge of experience, so ask to see plenty of examples of other work that the photographer has shot. Not just cherry picked images but also complete weddings. It’s important to check the quality and consistency for a variety of weddings. Ensure that they are clear on the level of coverage you require. If you want a photographer from the point of getting ready to the first dance, then make this known from the outset. Again, it might be boring, but read through their terms and conditions to make sure they are acceptable to you. It may only be the small print, but it’s vital and it could make all the difference. A good wedding photographer should visit the locations involved on the day so that they can make visual plans. Ask potential photographers if they will be doing this and at least you’ll have an idea as to their level of commitment. After all, it is the biggest day of your life and one you want to cherish forever. 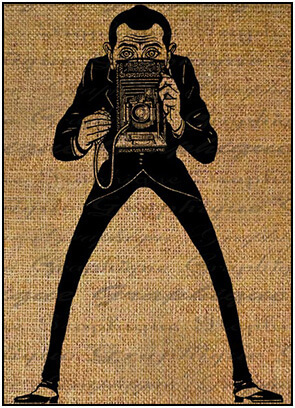 Don’t forget that there are a variety of different styles of photography as well as presentation. If one photographer doesn’t share your vision, then try another one. Bear in mind that it’s not that easy for any photographer to radically change their style to suit yours, so you’d be better to find whose style you immediately like. By the time you’ve reached this stage with the couple or so photographers on your short list, you should have a pretty good idea of which one you would like at your wedding. Now it’s just a case of booking them. Finally you can breathe a sigh of relief, and tick wedding photographer off your lengthy ‘to do’ list. Now you can move on to the next item, knowing that you have found the right professional. Remember if you want professional photographs which showcase the magic of your wedding, then choose a professional. At the end of the day when the wedding dress is packed in a suitcase and the cake has been eaten, you’ll still have your lovely memories to cherish; but it would be nicer still to have photographs around you which will put a smile on your face and transport you back to that special day. 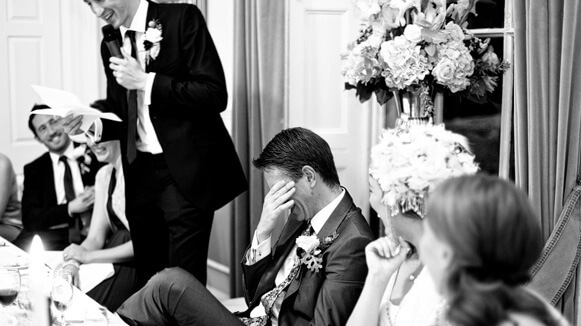 Don’t just rely on your wedding photographer to take all of the photos. Whilst you’re engaging with the wedding photographer or trying to mingle with all of your guests, there can be lots of things happening which you’re not even aware of. One way to see your wedding day from a totally different angle is by giving your guests disposable cameras. They’ll enjoy taking fun shots and you’ll experience the warmth and joy of candid shots taken by your closest friends and family. most flamboyant dancer on the floor or cutest child, in order to get shots that the wedding photographer won’t already have covered. Make sure the cameras have a flash for indoor use too. Good luck and hope you have the wedding day of your dreams. If the next item on your list is to ‘look for Wedding chauffeur service in London’, then we’d be delighted to help.